How can diversify the holiday in the country, to makeit is easy, fun and enjoyable? 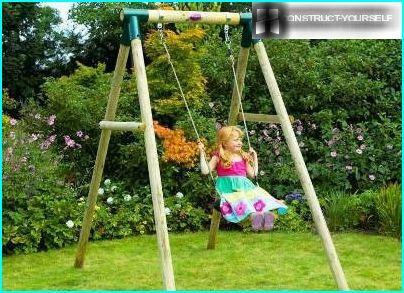 Ways are many, and one of them - the installation of a swing in the garden or on specially provided for the children's playground. Will it be a separate structure or device in the gaming complex - no difference, as long as it has brought a lot of joy and positive emotions. 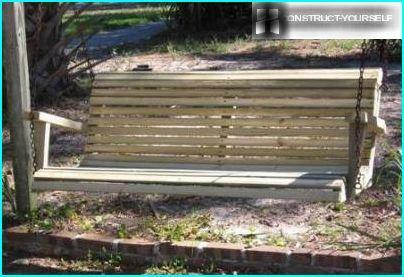 To save money, and at the same time and to please their loved ones, you can build a garden swing with their own hands: they will stand out from the purchased models of original ideas and unique finish. Before the creation of the sketch,you need to answer two questions: where will be established the construction and for whom it is intended? 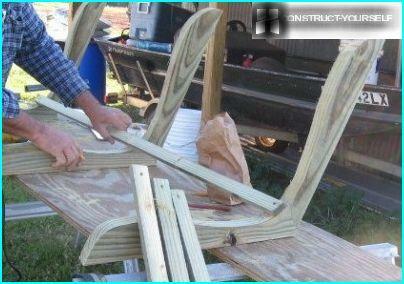 Depending on the answers to make an estimate, prepared a drawing of garden swings, pick up tools and material. For the whole family. 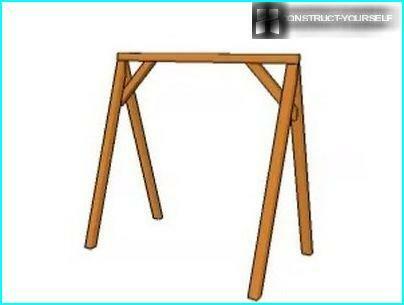 This is a large-size structure, often in the form ofbench with a high back, in which several people can be accommodated. The product is suspended in a sturdy frame in U-shape with the help of chains. A small shed on the cross beam allows the use of a swing in almost any weather. Baby. Quite a diverse group: here and frameless products consisting only of the suspension and seats, and sturdy construction with a seat in the form of armchair and large structures such as "boats". Frame models are safer. On any type of swing for the youngest children should be provided for fixing belts. Portable. 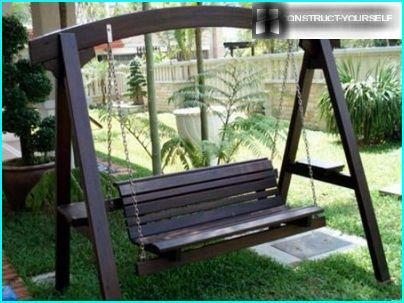 Mobile swing of this type is usually hung in the room: at home, on the veranda, in the gazebo. They can at any time be removed and installed on another site. Each of these types has its own advantages and can be used in the country for rest and recreation. Swing one certainly boring, so we present the option for a fun company - swing in a wide benches, which can accommodate several people. The proposed parameters can be changed - for example,make wider or narrower seat, backrest height of a little more or less. The main thing is that you can comfortably sit and relax. 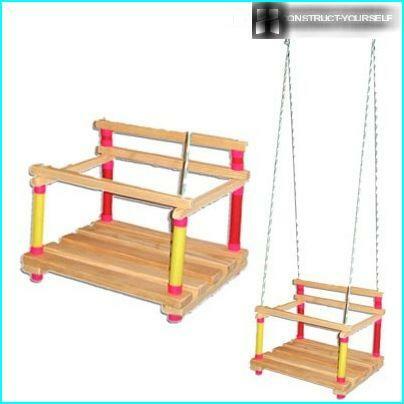 These swings are designed for the garden or recreation areas, using them can both children and adults. 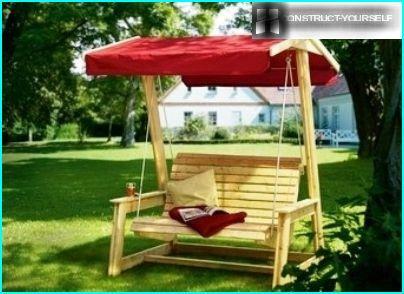 Holiday swing can be hung to a large horizontal branch, but it is better for them to establish two pillars with a cross beam. If the country were built recently, inmaterial sourcing issues will arise - in fact everything you need is already at hand. To produce best wood - soft and supple in the processing of the material, but strong enough to withstand the weight of several people. Birch, spruce or pine and are ideal for performance and cost. galvanized screws with rings - 4 pieces (steam and steam 12h100 12h80). Metal parts and screws can be combined with the color of wood or, on the contrary, be contrasting (eg, black). 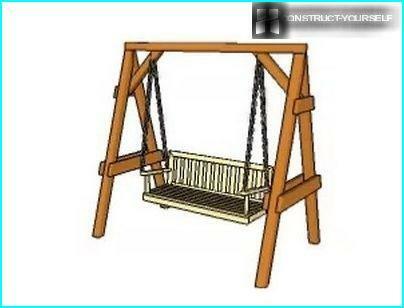 For the construction of garden swing from a treefit the traditional tools for processing this material: drill with various drill bits, circular saw, hammer, jigsaw or handsaw, plane. 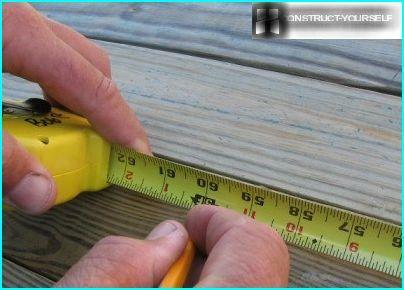 Elbow, tape measure and pencil handy for measuring workpieces. 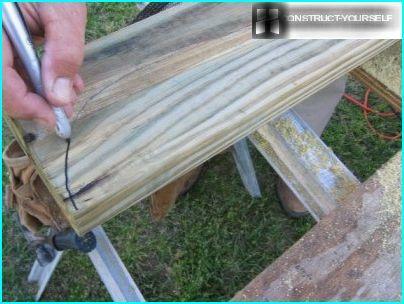 From the boards should be cut off pieces of a length and a half meters. Angles blanks should be straight. 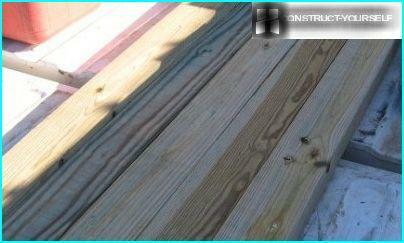 The thickness of the finished strips should not be less than 20 mm. The load on the back will be much smaller, so enough thickness of 12-13 mm. Approximate number of seat brackets (500 mm) - 17 pieces for the back (450 mm) - 15 pcs. 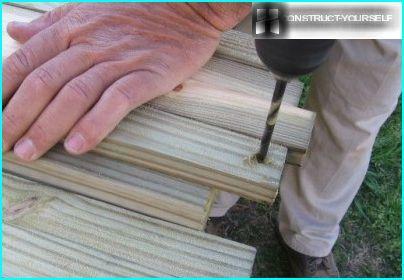 To protect the wood from cracking holes for screws are drilled with a drill by a thin drill. Hole depth for tapping - 2-2.5 mm. 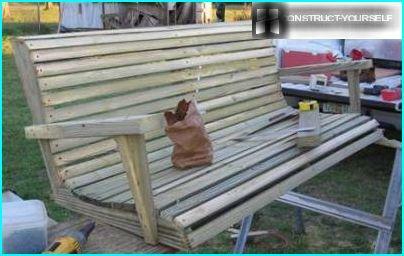 To seat and backrest were comfortable, detailsfoundation on which slats are attached, better made straight and curly. For their manufacture require the thickest board (50 mm x 150 mm). Thus, you get six curved pieces for the frame. After selecting the desired angle of the backrest and the compoundseating parts should be combined in frame and in turn lock the strap, making the same interval therebetween. Please fasten the ends of the parts, and then - the middle. The armrests are made of two beams of arbitrary width, then fixed at one end - on the seat, the other - on the backrest frame. The most convenient place for mounting screws with a ring - the lower part of the armrest bar. To nuts are included in the timber,you must use the washer. Similar rings bolted to the upper beam on which to hang a swing. The chain is attached to the rings via carabiners - Recreational ready! Simple and versatile option - side racks swings, on which you can hang different types of seats. Let us dwell on the structure holding the installation. Materials and tools for construction are the same as in the foregoing description. Externally, the design is as follows: two racks as letter "A", the upper crossbar connected. For a start it is important to calculate the angle of the joint vertically standing parts. 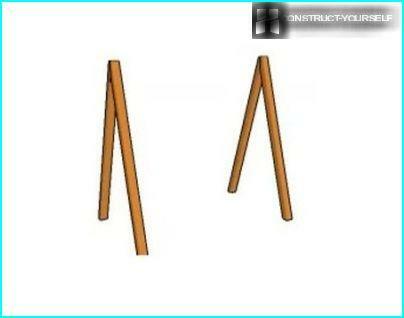 The larger width of the seat intended, the wider the racks must be placed. Bars (or poles) fastened to the upper part by means of bolts - for reliability. To the vertical elements are dispersed, theirfixed beams at a height of 1/3 of the soil. When setting the bar will be located parallel to each other. Top attachment for them - corners, planted on the screws. Usually, only one pair of bars forties, but sometimes do, and the second - at the top of the structure. 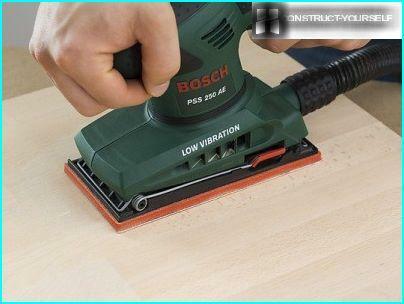 Together with them, increase attaching the upper crossbar - mounted on the inside wooden or metal plates in the form of a trapezoid. On the side stands ready to secure the referencecrossbeam, and then set the building into the ground. For this purpose two pairs dig wells (at least 70-80 cm deep - for greater stability), which are satisfied at the bottom cushion of crushed stone (20 cm), and inserted into the rack of the concrete poured. 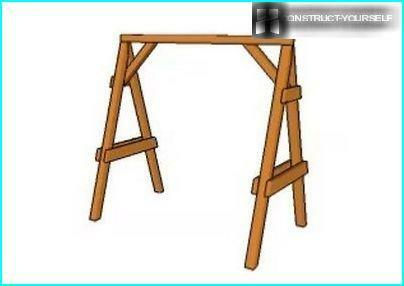 To check the level, horizontal position of the upper beam using a builder's level. The top bar can be fitted with fixtures,established at different width, the result is a structure on which to hang a variety of swing - from simple rope to the family sofa. 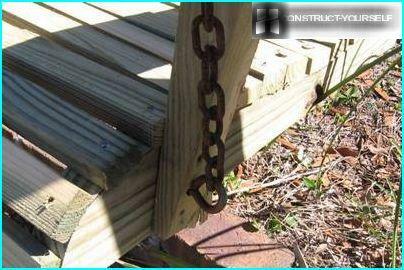 By establishing children's swings, it should be remembered thatin the first place - the security, so all parts must be carefully sanded with sandpaper. For this reason, wooden items should be "without a hitch, without a hitch" - defective wood is not suitable for load-bearing structures. Sharp corners must be smooth with a file. Also it is necessary to take care of the swing itself. Processing impregnation, paint or lacquer finish will prolong the existence of structures and galvanized fasteners will prevent the destruction of the inside timber. 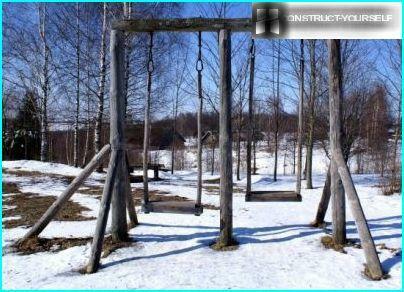 Since you will be doing yourself a swing,it is possible to dream and to give them a certain originality. 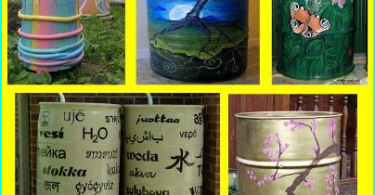 Of course, decoration items - a purely personal decision, but some of the ideas you can borrow from the finished designs.